I had initially intended to bring you the January metagame update today, but looking over the data and consulting with Sheridan, we decided to wait a week in order to incorporate more post-banning data, including Star City Games Regionals. Instead, we’ll be covering one of the early changes that has resulted from Wizards’ recent format shake-up. The banning of Gitaxian Probe was obviously intended to nerf aggressive creature-combo strategies like Death’s Shadow Zoo, Infect, and UR Prowess. These decks were undoubtedly struck a blow, but don’t expect them to disappear entirely. Adapting to a Probeless world may prove challenging, but Death’s Shadow is already exhibiting a shift that seems to account for the new environment. Enter “Death’s Shadow Jund,” as I’ve unilaterally decided to christen it. Right out of the gates, MTGO players seem to have rapidly arrived at a close-to-consensus build for Probeless Death’s Shadow. As early as January 11th, the very date the Probe and Grave-Troll bans went into effect on MTGO, the new build appeared in a League finish. Since then it has posted consistent League results throughout the month, and put two pilots into the Top 8 of the MOCS Playoff on the 21st. The decks in question show relatively little variation in card choice. Oliver_Hart’s version from the MOCS Top 8 is typical of the lot. As you can see, the updated deck goes far beyond mere cosmetic changes or a simple replacement for Gitaxian Probe. The first thing to notice is that Death’s Shadow has become a Traverse the Ulvenwald deck. The archetype’s pilots have played around with this card before, but rarely included it as a four-of or relied on it so extensively. Now they’ve cut all of the Steppe Lynxes, Monastery Swiftspears, and Wild Nacatls, relying entirely on the dual sets of Tarmogoyf and Death’s Shadow itself to end the game. With just 8 real threats, the creature tutor becomes a critical piece of the game plan. They’ve borrowed another experimental piece of tech from pre-ban lists in Ghor-Clan Rampager, which acts as a kind of tutorable Temur Battle Rage off of Traverse. To make sure Traverse is reliable, the deck is packing the full complement of Tarfire and Mishra’s Bauble. Tarfire is obviously a pretty big downgrade from Lightning Bolt, but for our efforts here we can expect Goyf to regularly hit the 5/6 mark in the early game, and we get access to the best Green Sun’s Zenith impersonation available since the original’s banning. Also helping in this regard are the Collective Brutalitys, which can dump an extra card type in the graveyard while disrupting the opponent’s plan or proactively protecting your lone threat. As for Battle Rage, one of the hallmarks of the old Death’s Shadow decks, note that it’s been pared down to just 2 copies (other builds sometimes run 3). This along with a complete absence of Become Immense. Longtime Death’s Shadow players are well aware of how easy it is to reach the requisite 4 power to turn on a fully-powered Battle Rage, and the addition of Tarmogoyf no doubt assists in the quest. But the fact that they’re running so few copies of this effect would imply that this version is built to function on a different axis. This new Death’s Shadow Jund has shifted away from the creature-combo Gotcha! dimension towards a more traditional bent somewhere between aggro and midrange. Kolaghan’s Command, Collective Brutality, and Liliana of the Veil let the deck take on a control role that old Death’s Shadow decks would have been hard-pressed to assume. Grinding into the late game is possible here, if much less natural than in actual Jund decks. But that Gotcha! element remains, and it gives the deck game against the ramp strategies that BGx midrange decks usually fold to. This deck is not very afraid of an opposing Urza’s Tower, as absent significant disruption the deck will kill very quickly with a giant Goyf or Death’s Shadow. As I mentioned, these lists appeared in week one of the post-banning environment—it appears quite clear that the aggro-combo decks targeted by the Gitaxian Probe ban have not died. 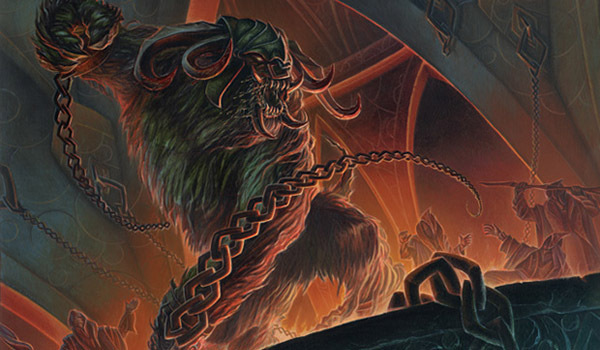 Their task is complicated further by the arrival of Fatal Push and, strangely, the departure of Golgari Grave-Troll, which until recently was keeping down their traditionally bad matchups. But that said, I doubt we’ve seen the last of the Gotcha! decks. My own run with Infect this weekend at Regionals was, um… disappointing, to say the least (let’s just say after dropping I had time for two entire side drafts). But even Infect will adapt and survive, rest assured. I would say that the bannings on Wizards’ part have done a great job of bringing Modern back into sane territory, with turn-three kills receding ground and interactive decks left room to breathe. Even if my own weapon of choice has been significantly downgraded, I can say that the new Modern seems much more appealing on sum. Join me next week when I’ll go over some more quantitative measures of the post-Probe and -Grave-Troll metagame. I can say from surveying the January data alone (half of which fell before the changes to the banlist) that things have changed dramatically. Until then, keep brewing and let’s hope this turn-two Cheeri0s business proves as fragile as its detractors have claimed. I love me some MN meta update but I agree that holding off for a short while to collect more data looks like the right choice. Stoked to see these on the calendar for regular updates again! Thanks for the overview of the new DS build. Turn 2? Cherri0s (or Sram-O’s as it’s being called now, it seems) can win on turn 1 now using Simian Spirit Guide. I’ve been victim to this more times than i care to count. I think that delaying the update was the right call. The pre-January 11th dataset is probably pretty different from the second, and it doesn’t make much sense to mash them together. I look forward to the next update being our first in-depth look at the post-ban metagame. This will give time for people to adjust to the new cards from Aether Revolt as well. As for the deck presented… I greatly enjoy the direction Death’s Shadow has been taken in. This deck is interactive, interesting, and it doesn’t seem to have sacrificed much (if any) power in the process. I worry about how it will fare in a world with Fatal Push (which is a very clean answer to all of its threats), but I suppose that remains to be seen. Glad you chose to spotlight this one! One of the deck’s most consistent pilots, GHash77, has been putting up results both before and after the release of Æther Revolt. He has also streamed some of his leagues on Twitch under the same username if you’re interested. The deck seems to be performing online, it’ll be interesting just how well it will translate to paper results.